Bai’s Experiences sweepstakes, running from now until August 31st, offers the ultimate grand prize for anyone with a case of wanderlust, a 6-night getaway including airfare, hotel, and spending money for 1 of 5 trips to the exotic coffee growing regions Bai’s flavors are named after. To enter, participants are asked to pick one trip that fuels their flavor and are then entered to win the exotic adventure of their dreams. Locations include Panama, Tanzania, Hawaii, Costa Rica, or São Paulo. Bai’s campaign has all the right flavors to be a standout and success. A multi-platform approach: Along with creating the microsite to collect sign ups, Bai created an interactive site embedded on their website to sell participants on the lavish vacations they could possible win. Each description was linked to another page, or Bai’s social media accounts. By creating a multi-platform approach, there were no dead ends. Participants had multiple opportunities to engage with Bai. Sell your story: marketers and communicators are constantly being told, “tell your story”, “sell with a story”, “have a clear story”, and for good reason. Consumers love stories. Even as our attention spans are dwindling, consumers are still actively seeking out and looking to engage with a good story. 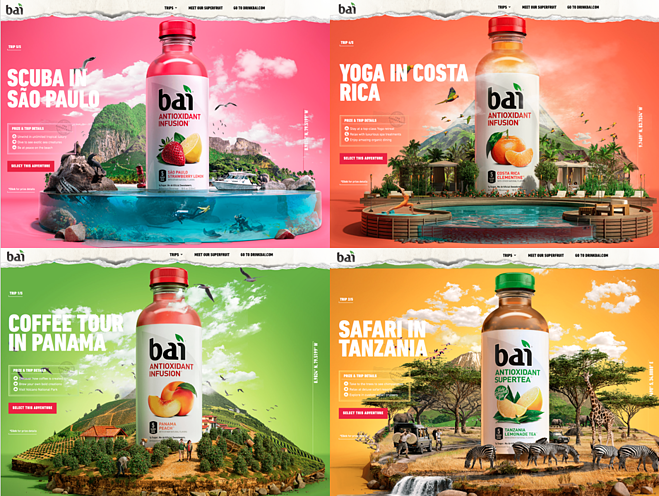 While Bai’s sweepstakes was simple, they built their sign up around a compelling and creative story about the exotic locations they source ingredients from, the beauty in each location, and their vision as a brand and for your vacation. Speak your consumers’ language: In addition to developing a beautifully crafted story, Bai knew their consumers and knew how to speak to them. Understanding your audience is key to telling a compelling story. Bai asked, “If you’ve always wanted to know what it’s like to sip an unrivaled cup of coffee straight from the field, this is your chance,” and “Have you been dreaming of your very own undersea adventure?” Bai knew their consumers are adventurous, curious and their built a campaign that doesn’t just incite the need for a vacation — it makes you want to follow through and win. Not sure about you, but we sure do! For more tips and inspirations from other campaigns run using the Wyng platform visit our resource center here.